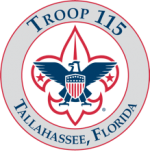 On October 27 Troop 115 members, families and friends gathered in Sanders Hall for the Fall 2014 Court of Honor. After opening the event with the traditional Flag display and benediction, those in attendance dined on pizza and a variety of salads and desserts provided by Troop members and families. After the meal, Scoutmaster Merryday and our Troop’s dedicated Assistance Scoutmasters presented Scouts with the merit badges and rank advancements earned since the previous Court of Honor. The event closed with announcements from Mr. Bullen regarding upcoming Christmas Tree sales and Life Scouts on their upcoming Eagle Badge Project Plans. Congratulations to all our Scouts on their merit badge and rank advancement achievements! There are several websites listed below. The SRAC website has information on Summer Camp and High Adventure opportunities. The BSA websites have more general information that may be helpful in learning about Boy Scouts. May 6, 2019 6:30 pm – 8:00 pm May Court of HonorIt's our last big hurrah before Summer Camp. Come and recognize our scouts' merit badges and advancement. It's been a good year and we have reason to celebrate. May 10, 2019 5:35 pm – May 12, 2019 12:00 am Canoe tripRegister NowWe will be canoeing on the Blackwater River. All content copyright Troop 115 1962-Present.